Great challenge. You are to use the same image three times as a focal point. The first thing that came to my mind were these cute little stockings. This set has a double die for the two different size stockings. How cute is that?? First I die cut three little stockings. Then I took one of the stamps (since the image was to be the same) and stamped them on the die cut using Old Olive. Don't you just love clear stamps? It was so easy to do because you can see through the stamps to the die cut. Then I took a piece of Pure Poppy and Harvest Gold felt and die cut just the top part of the stocking to give me a cuff. I used my scissors to cut the length to fit. 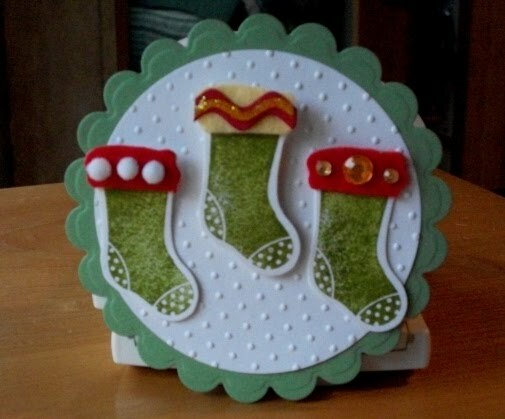 Then I added rhinestones, cotton balls and a tiny piece of Real Red ric-rac left over from a previous card and placed on the top of the middle one. Yellow Stickles were used on the ric-rac. The card base is the next to largest Nestability circle. Be sure to cut it on the fold leaving a little bit of it out of the die to ensure you have a fold for the card. Cut and emboss the largest scalloped Nestability circle. Place this on top of the circular white base. Cut another piece of white and emboss it using the Dotted Swiss EF. Take the little stockings and place them on the front with the center one raised on foam adhesive. I have the card propped against a styrofoam cup. You cannot see anything underneath the green scalloped piece. Hope you like it.